LA Gold Buyers / AAA Pawn & Jewelry Inc address, phone, website, hours of operation, and more. Sell your unwanted Gold, Diamonds, and Jewelry for Cash now! We pay up to 20% more than our competition for your gold and or scrap gold jewelry. We are committed to customer satisfaction, and we provide fast and friendly service with the best prices for your gold. Getting paid for your gold, diamonds, and or jewelry has never been easier. Simply stop by one of our locations, so that we can test your gold and or jewelry for precious metal content. Next, we will show you the results and make an offer! Los Angeles Gold Buyers is a Southern California premier fine jewelry and gold buyer located on 1523 South La Cienega Boulevard, Los Angeles, California 90035. 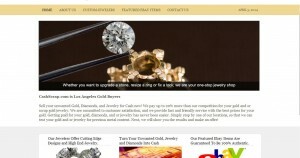 Los Angeles Gold Buyers is a successful business located in Southern California for many years. We believe customer service is the most important thing in business, so by choosing us you will get personalized service, fast response for any questions, comments or concerns that may arise. Want cash now? Bring your unwanted Gold, Diamonds, Jewelry and Watches, and we will give you ash-on-the-spot! We make it easy to turn your unwanted diamonds, gold, watches and fine jewelry into cash. Our business looks to bring the community a great selection of products at lowest wholesale prices. We specialize on high-end jewelry, watches, coins, that’s why every little thing is thoroughly examined for authenticity before being put up for sale. Every gemstone and diamond is tested for quality and content. Upon your request we can resize, customize or even create jewelry you dream of because customer satisfaction is our priority with every purchase! Our showroom offers brand name Jewelry and High-end watches such as Cartier, Patek Philippe Watches, Piaget, Audemars-Piguet, Vacheron & Constantin, and Antique or Platinum Jewelry.